Enjoy these photos and video clips from Brooklyn Fare 200 Schermerhorn Street, Brooklyn, NY 11201, because it may be a while before you get reservations. Still try! It is worth the wait for what I consider the best bang-for-your-buck ($95 per person and BYOB) in New York. 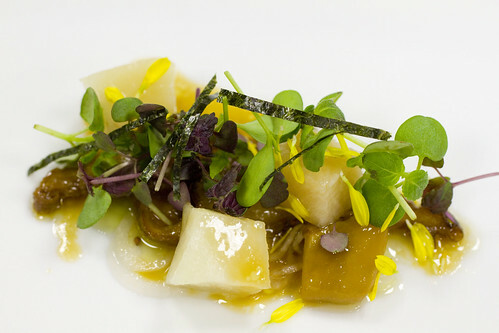 If to say “Chef Ramirez is a perfectionist” would be an understatement, then to say he’s “obsessed with white China” would be the king of understatements. He sees each plate as the canvas for his art. Each piece is washed and put away in boxes the night before. Before service, each piece is hand polished with a touch of white vinegar. Throughout the night, he glows like a child on Christmas, reminding me that he’s getting shipments of a lot more. 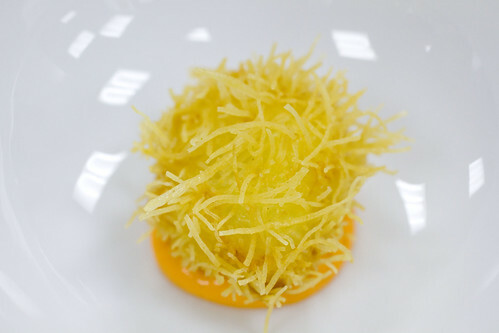 Cesar let me in on how he made this Carrot, Orange, Ginger Soup with Yogurt Foam. 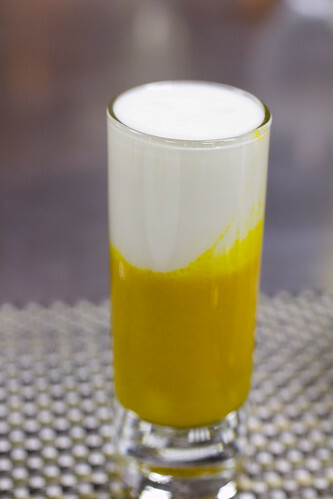 He makes carrot, orange, and ginger juice, each separately first, keeping them very concentrated. They are brought together and warmed for a really potent shot of soup. 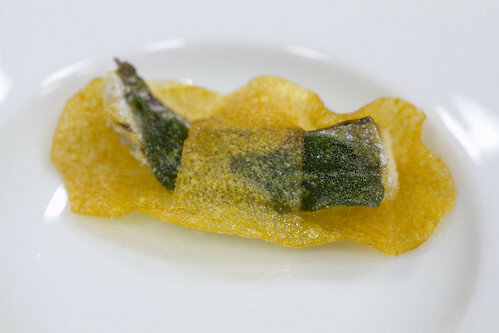 We saw this Sardine and Sage Potato Crisp last time. Again, what precision for a chip that is barely 2″ long. The Crab and Kataif looked a bit different this time, with shorter strands of kataif and a red pepper sauce (last time it was a dill sauce). The melt-in-your-mouth Toro is served with a creamy house-made mustard and a few drops of soy, then topped with fried leeks and micro leeks. 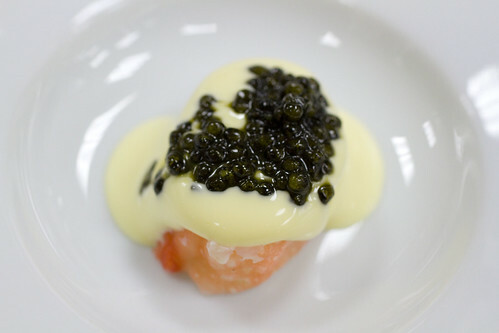 A bite of King Crab with a luscious and mayo-like sauce, topped with caviar. 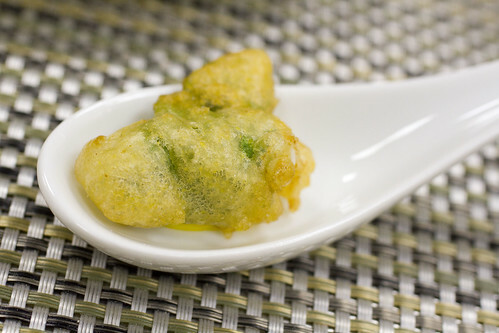 Here, a fried Langoustine with a Spanish herb (sorry, forgot the name). The Kumomoto Oyster, with Oyster juice Gelee, and grapefruit was still delicious, but not quite as delicious as last time, when it was served with some uni for some extra cool coating of the tongue. 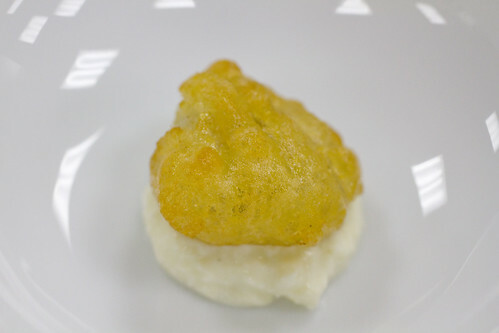 Chef Ramirez asked us all to try this fried goodie before announcing what it was. We took some guesses, but no one came up with the answer, which was duck testicle! While my friend’s date grabbed for water, I cheered, always excited to try new things. It was round, bouncy, and chewy, almost like sweetbreads. It’s not something I’d go out of my way for, but I would eat it again. 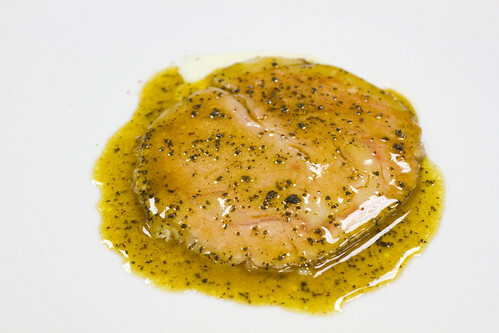 The Foie Gras with black pepper powder was perfect. Cesar believes in cooking it all the way through. 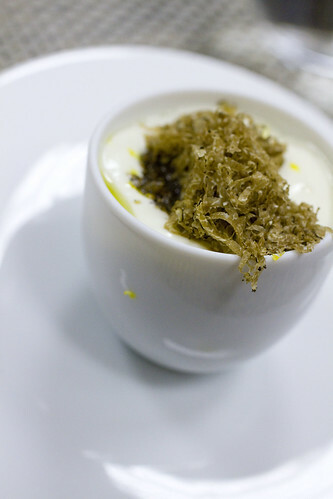 The Creamy Cup of layered oils and foams was familiar and very welcomed. 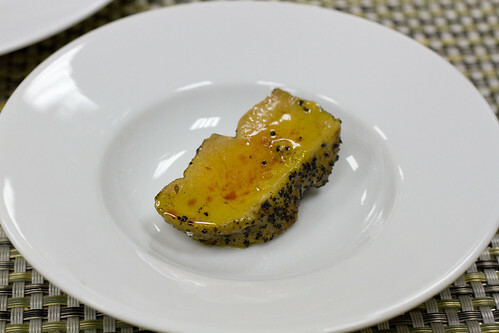 Watch how much fresh truffle is grated for this. The chunks of Hamachi dance in a beautiful garden here. Just before dinner, I watched Cesar make this salad. It doesn’t get any fresher than cutting it right off the plant. This is the best ( I don’t use that word often) shrimp I have ever eaten. As I was sucking the juicy shrimp head and talking about it, Ilana did the “that’s what she said” bit. I didn’t care as I was in heaven. I could get high and drawn in it. This perfectly round Potato Crisp is made with liquefied potato, baked, then fried. I watched Cesar prepare these delicate pieces with tweezers. They broke so easily. 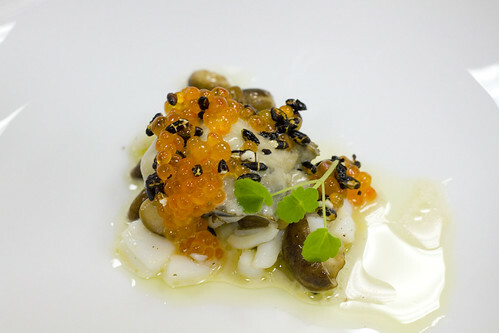 Underneath is a delightful play of textures: Hama Hama Oyster, razor clam, elf mushrooms, salmon roe, black rice, and micro greens that tasted of licorice. This Line Caught Sea Bass was perfectly tender but it was the thick and crisp skin that many asked about. The secret: scales were left on. Days later, Lon is still talking about the veal. I can’t blame him since it was the best (again, with that word) veal I’ve ever tasted. A thin, rare slice from a tightly tied roulade in a perfect circle. 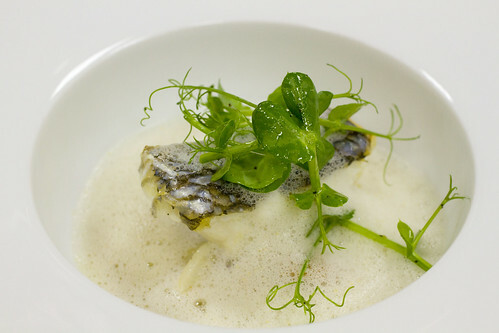 It lays on a soft pillow-y layer of cooked onions and Parmesan cream. We were so overly excited to dig in to dessert after hearing bananas were involved. Neither of us took a picture. Good thing I have some video. …and because I’m such a good friend, I made her wish come true. posted by jessica	at 12:33 PM	Filed under Fusion or Mixed, Restaurants, Video. You can follow any responses to this entry through the RSS 2.0 feed. Both comments and pings are currently closed. Wow, what an incredible meal! Every bite looks so perfect! I want to make that soup with yogurt foam at home! Oh my goodness, those pictures are AMAZING and his attention to detail is insane. I would love to try this place. For real? Only $95 for all that and BYOB – I’m so there next time. btw – what are the odds that both of us would post about eating duck testicles on the same day. lol . . . Waw!! What a fabulously looking meal this was!! Wow, how lucky you are to have gotten a behind-the-scenes experience! The food is beautifully presented. We also had our second visit to Cesar Ramirez’ Brooklyn Kitchen last week (probably a day or so from yours, judging from the menu). 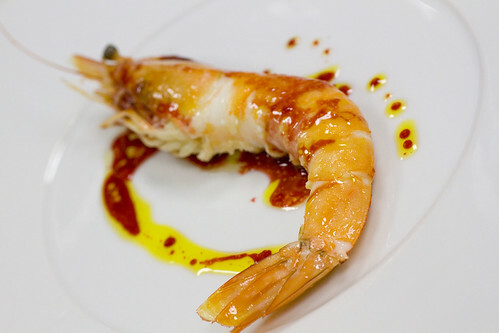 The herb Cesar used on the langoustine was Mexican and sounded something like “payot.” Sorry if I messed up the name. Cesar has gotten some incredible press lately, making return visits less and less likely (did you see Alan Richhman’s piece in GQ?). Suffice it to say, we feel privileged to have enjoyed two of Cesar’s dinners. This is truly one of NY’s culinary gems. Every photo and video was better than the one before! Such a pleasure to see. Thanks! this restaurant looks awesome! Or maybe your photography is just insanely good. Or both! So lucky that you got to talk to the chef one-on-one! Also I was curious about the saucing on the veal. Is that the Parmesan cream topping the veal? Thank you and I thoroughly enjoy your site! Natasha, let me know if you do! Jen, yea, I think we should play the lotto. Famdoc, ooh, you had a eggplant parm. Sounds so regular but nothing Cesar makes is regular. I did just see the Alan Richman piece so I bet it will be harder to get reservations now. I’m glad I booked it again already! Joanne, really Cesar deserves all the credit. RobertR, I didn’t remember what the sauce was exactly so I didn’t want to write it. It was some sort of demi-glace I think and the parmesan cream was underneath. Sorry, sometimes when meals are this lengthy, things get a little fuzzy. Jai, I do get really antsy but I usually only snap one shot of each dish. Cesar was the sous chef at Bouley before, and probably had to do a lot with why I had some great brunches there, even though I didn’t know it at the time. I definitely recommend Brooklyn Fare to everyone! I think the herb is espasote. It is a fairly little-known Mexican herb. but it is very easy to grow. Many seed catalogs sell the seeds. Beautiful pictures! One important correction though: For the last 6-ish years there, Cesar Ramirez was not the “sous chef” at Bouley, he was the Chef de Cuisine. 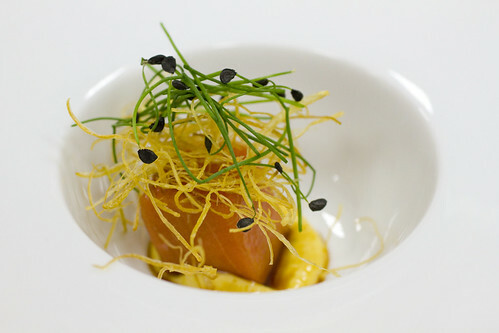 He ran the kitchen, planning and preparing the food that earned the restaurant 2 Michelin stars. 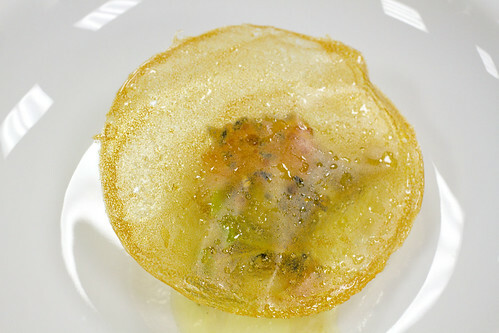 When Bouley lost Cesar, it lost one of those Michelin stars along with him. BTW, Brooklyn Fare is finally on Facebook! Culinary Sagacity, thanks for the info. In the future, please disclose your affiliation, but I’ll be a facebook fan for sure, and I’m looking forward to my next reservation, in just a couple of weeks. These dishes look really exciting, and the restaurant is right next door to the apartment I’m moving into in a month, but it’s all seafood! I guess I’m the only person in this city who needs more duck testicle than toro.